Under the threat of subpoena, the Justice Department reluctantly provided lawmakers with Comey’s memos about his meetings with Trump. WASHINGTON — President Donald Trump’s first chief of staff directly asked then-FBI director James Comey whether federal law enforcement was surveilling Michael Flynn, the national security adviser at the time, Comey documented in a memo after the White House discussion. In that Feb. 8, 2017, meeting, Comey writes that he also told Reince Priebus, the chief of staff, that the material from the so-called Christopher Steele dossier had been corroborated by other intelligence, redacted versions of Comey’s memos that were turned over to members of Congress reveal. The Justice Department on Thursday reluctantly provided lawmakers with Comey’s memos under the threat of subpoena. NBC News obtained the 15-page document, which are Comey’s contemporaneous summaries of seven interactions with Trump and other White House officials from early January 2017 until just before Comey was fired that spring. 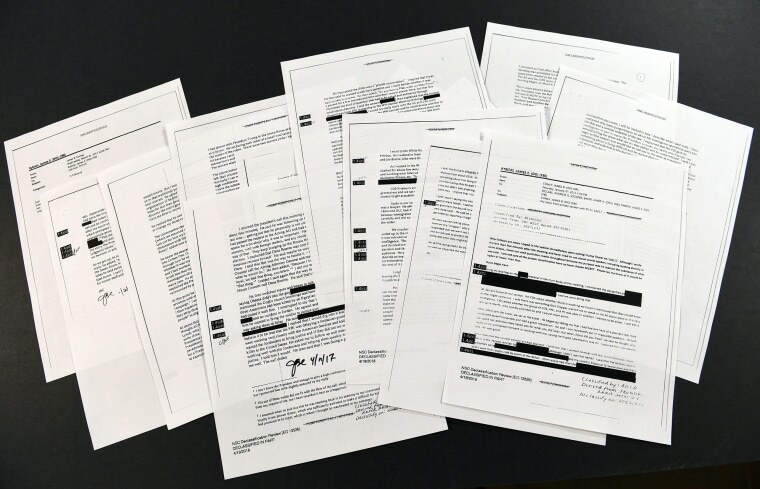 Much but not all of the memos' contents were already public record, revealed during Comey’s testimony before Congress, in his newly released book or in press interviews. They portray a president seemingly consumed by the Russia investigation and the "cloud" it had placed over his young administration, and detail his request for Comey’s "loyalty." In Comey's accounts, Trump on multiple occasions frets over one of the most salacious claims of the dossier involving Russian prostitutes, and repeatedly questions the motives of Comey’s deputy, Andrew McCabe, whose wife had been a Democratic candidate for elected office in Virginia. Among the new details: Comey recalls Trump casting doubt on Flynn’s judgment during a private White House dinner, after an episode in which the president had discussed congratulatory calls from foreign leaders. The president also once mused about prosecuting members of his administration who were leaking sensitive information to the press, and whether reporters themselves might also be jailed as part of a crackdown, according to the memos. Comey also says he expressed reservations about Priebus questioning him about whether the FBI had obtained a top secret FISA warrant on Flynn. Though he answered the question — his response is redacted in the document provided to lawmakers Thursday — Comey writes that he told Trump's chief of staff at the time that in the future such questions should be handled through official channels, including requests to the Justice Department or dialogue by way of the White House counsel's office. Trump has repeatedly denied asking Comey for his loyalty or for him to end the investigation into Flynn, as detailed in the memos, and has called Comey a liar. Late Thursday night, Trump tweeted that the memos prove that he never colluded with Russians or obstructed justice. And he returned to Twitter early Friday morning, slamming Comey as "Shadey" (sic). In one discussion with Trump about what the president called "the hookers thing," Trump said Russian President Vladimir Putin had once told him "we have some of the most beautiful hookers in the world." Comey adds that Trump did not say when Putin told him this. And Comey recalls Trump telling him at one point that he planned to file a personal lawsuit against Steele, the former British intelligence operative contracted by an opposition research firm with ties to the Clinton campaign. No suit was ever filed. Unredacted copies of the Comey memos were to be made available to members of Congress Friday at secure facilities at the Capitol. The Justice Department’s decision to turn them over to lawmakers came just days after Deputy Attorney General Rod Rosenstein wrote to the Republican chairmen of the House Oversight, Intelligence and Judiciary Committees expressing concern that providing them could affect an ongoing criminal investigation. It was the second time in as many weeks that the Justice Department has relented in a face-off with Trump allies in Congress and provided access to sensitive materials at the heart of the Russia investigation. Last week, House Intelligence Chairman Devin Nunes, R-Calif., and Oversight Chairman Trey Gowdy, R-S.C., met with Rosenstein and viewed the electronic communication tied to the launch of the counterintelligence investigation of the Trump campaign in 2016. In a joint statement, Nunes, Gowdy and House Judiciary Committee Chairman Bob Goodlatte, R-Va., said the memos were significant "for both what is in them and what is not," asserting that they do not suggest any attempt by Trump to obstruct justice. "Rather than making a criminal case for obstruction or interference with an ongoing investigation, these memos would be Defense Exhibit A should such a charge be made," the chairmen write. Rep. Elijah Cummings of Maryland, the top Democrat on the House Oversight Committee, countered that Comey’s contemporaneous notes about his interactions are "strong corroborating evidence" of his public claims about Trump. "President Trump’s interference was a blatant effort to deny justice, and Director Comey was right to document it as it happened — in real time," Cummings said.